In case you haven’t noticed, the world is on the verge of a horrific global food crisis. At some point, this crisis will affect you and your family. It may not be today, and it may not be tomorrow, but it is going to happen. Crazy weather and horrifying natural disasters have played havoc with agricultural production in many areas of the globe over the past couple of years. Meanwhile, the price of oil has begun to skyrocket. The entire global economy is predicated on the ability to use massive amounts of inexpensive oil to cheaply produce food and other goods and transport them over vast distances. Without cheap oil the whole game changes. Topsoil is being depleted at a staggering rate and key aquifers all over the world are being drained at an alarming pace. Global food prices are already at an all-time high and they continue to move up aggressively. So what is going to happen to our world when hundreds of millions more people cannot afford to feed themselves? Most Americans are so accustomed to supermarkets that are absolutely packed to the gills with massive amounts of really inexpensive food that they cannot even imagine that life could be any other way. Unfortunately, that era is ending. There are all kinds of indications that we are now entering a time when there will not be nearly enough food for everyone in the world. As competition for food supplies increases, food prices are going to go up. In fact, at some point they are going to go way up. Let’s look at some of the key reasons why an increasing number of people believe that a massive food crisis is on the horizon. The following are 20 signs that a horrific global food crisis is coming…. #4 Due to a lack of water, some countries in the Middle East find themselves forced to almost totally rely on other nations for basic food staples. For example, it is being projected that there will be no more wheat production in Saudi Arabia by the year 2012.#5 Water tables all over the globe are being depleted at an alarming rate due to “overpumping”. According to the World Bank, there are 130 million people in China and 175 million people in India that are being fed with grain with water that is being pumped out of aquifers faster than it can be replaced. So what happens once all of that water is gone? 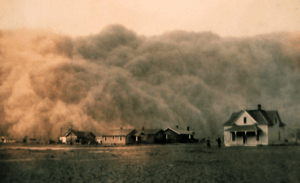 #6 In the United States, the systematic depletion of the Ogallala Aquifercould eventually turn “America’s Breadbasket” back into the “Dust Bowl”. #7 Diseases such as UG99 wheat rust are wiping out increasingly large segments of the world food supply. #8 The tsunami and subsequent nuclear crisis in Japan have rendered vast agricultural areas in that nation unusable. In fact, there are many that believe that eventually a significant portion of northern Japan will be considered to beuninhabitable. Not only that, many are now convinced that the Japanese economy, the third largest economy in the world, is likely to totally collapse as a result of all this. #9 The price of oil may be the biggest factor on this list. The way that we produce our food is very heavily dependent on oil. The way that we transport our food is very heavily dependent on oil. When you have skyrocketing oil prices, our entire food production system becomes much more expensive. If the price of oil continues to stay high, we are going to see much higher food prices and some forms of food production will no longer make economic sense at all. #18 There are about 3 billion people around the globe that live on the equivalent of 2 dollars a day or less and the world was already on the verge ofeconomic disaster before this year even began. #20 There have been persistent rumors of shortages at some of the biggest suppliers of emergency food in the United States. The following is an excerpt from a recent “special alert” posted on Raiders News Network…. It means that time is short. For years, many “doom and gloomers” have been yelling and screaming that a food crisis is coming. Well, up to this point there hasn’t been much to get alarmed about. Food prices have started to rise, but the truth is that our stores are still packed to the rafters will gigantic amounts of relatively cheap food. However, you would have to be an idiot not to see the warning signs. Just look at what happened in Japan after March 11th. Store shelves were cleared out almost instantly. It isn’t going to happen today, and it probably isn’t going to happen tomorrow, but at some point a major league food crisis is going to strike. So what are you and your family going to do then? You might want to start thinking about that. Use coupon code AFF500 and get Rs.500 off domestic India hotels with minimum spend of Rs.5000 at Travelocity India. Cheap Spring Flight & Hotel Deals. Book at OneTravel.com Now and Save $12 with Coupon Code SPRING12! Offer valid till April 29, 2011. 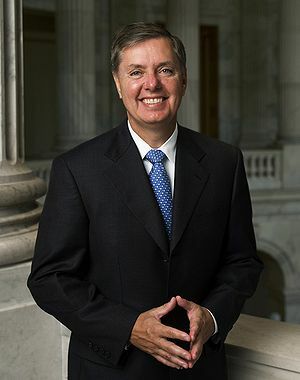 COLUMBIA (WACH) — Senator Lindsey Graham (R-S.C.) is drawing national attention stemming from controversial comments he made this weekend seemingly calling on Congress to impose limits on free speech. Graham said on CBS Face the Nation Sunday that the need to protect U.S. servicemembers overseas may justify limiting of political speech at home. Graham’s comments follow the burning of a Quran by Florida pastor Terry Jones, who said he organized the burning to “stir the pot.” The burning of the Islam holy book sparked rioting in Afghanistan, where at least seven people had been killed over the weekend as protests erupted again Monday for the fourth straight day. Graham’s comments about limiting free speech to discourage violent protests were quickly picked up by multiple national media outlets including Politico, Mediaite and The Atlantic. What do you think about Senator Graham’s comments? Is limiting free expression sometimes justified to protest U.S. troops overseas, or is the Senator’s oath to preserve and protect the Constitution more important? Please leave your comments below. Watch Sen. Graham’s comments on CBS Face the Nation. Muammar Gaddafi‘s forces have laid both antipersonnel and antivehicle mines during the current conflict with armed opposition groups, Human Rights Watch confirmed today. The mines – two dozen antivehicle mines and roughly three dozen antipersonnel mines – were found on the eastern outskirts of Ajdabiya, a town of 100,000 residents that government forces held from March 17 until March 27, 2011. 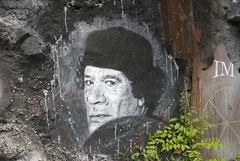 Libya is one of 37 nations that has not joined the 1997 Mine Ban Treaty. A total of 156 nations are parties to the treaty, and another two have signed but not yet ratified. The treaty comprehensively bans the use, production, and transfer of all antipersonnel mines, requires destruction of stockpiles within four years and clearance of mined areas within ten years, and calls for assistance to landmine victims. In recent years, the only government forces that have continued to lay antipersonnel mines are Burma’s. Rebel forces in Benghazi, now in control of the stockpile of antivehicle mines in the city’s arms depot, told Human Rights Watch that they will not use any type of mines. The pledge was made by Gen. Khalifa Hufter, commander of the rebel forces in Eastern Libya, during a meeting in Benghazi on March 25. Libya still has large numbers of uncleared landmines and explosive remnants of war as a result of World War II, as well as conflicts with Egypt (1977) and Chad (1980–1987). Exclusive deals and sales on computers & electronics. Click here for more info. A large scale cover-up of the extent and severity of Japan’s multiple nuclear meltdowns is now underway, according to Yoichi Shimatsu, the former editor of the Japan Times Weekly. Mr. Shimatsu appeared on CCTV, China’s state-run television network. Shimatsu contends that the Obama White House sent a team to consult the Naoto Kan government. Instead of dispatching experts from the Department of Energy, Nuclear Safety Agency and Health Department, representatives of USAID were sent to micromanage the cover-up. Since the 1960s, USAID – short for United States Agency for International Development – has maintained a close working relationship with the CIA, and Agency officers often operated abroad under USAID cover, according to author William Blum (Killing hope: U.S. military and CIA interventions since World War II, p. 142, 200, 234). The close relationship between USAID and the CIA is also documented in the long-suppressed “family jewels” documents (see pages 607 to 613). The CIA and the spooks are naturally concerned about their foothold on the Misawa Air Force Base in the Iwate Prefecture, hard hit by the earthquake. “Misawa, the hub of US electronic warfare and high-tech espionage in East Asia with its fleet of P-3 Orions and an ECHELON eavesdropping antennae,” Shimatsu notes. In addition, the establishment is worried about geopolitical aspects of the crisis, most notably in regard to regional “enemies” Pyongyang, Beijing and Moscow. Both China andRussia have both offered aid without strings attached and this is undoubtedly considered a threat by the political establishment in the United States. The Pentagon also has a vested interest in stage managing information emerging from Japan. In addition to its sprawling military bases in the country since the end of the Second World War, one of the military industrial complex’s major players, Westinghouse, runs a nuclear fuel operation at Tokai in the Ibaraki prefecture. Westinghouse took control of Japan’s Nuclear Fuel Industries Ltd — the country’s sole producer of fuel for both boiling-water reactors and pressurized-water reactors — in 2009. Toshiba Westinghouse closed the plant on Friday after the earthquake struck. The CIA, through USAID, is running a disinfo campaign on Japan’s earthquake crippled nuclear facilities for geopolitical reasons. The Japanese people will ultimately suffer, as will millions of other people who happen to be downwind from the stricken plants. President Obama projects that the gross federal debt will top $15 trillion this year, officially equalling the size of the entire U.S. economy, and will jump to nearly $21 trillion in five years’ time. Amid the other staggering numbers in the budget Mr. Obama sent to Congress on Monday, the debt stands out — both because Congress will need to vote to raise the debt limit later this year, and because the numbers are so large. Mr. Obama‘s budget said 2011 will see the biggest one-year jump in debt in history, or nearly $2 trillion in a single year. And the administration says it will reach $15.476 trillion by Sept. 30, the end of the fiscal year, to reach 102.6 percent of gross domestic product (GDP) — the first time since World War II that dubious figure has been reached.